Original album cover for Jimmy Cliff’s “The Harder They Come” soundtrack, July 1972, Island Records. Click for CD. In 1972-73, The Harder They Come, a Jamaican film about a poor country boy who becomes a music star and then a criminal, arrived at the box office with a very upbeat and powerful soundtrack of Jamaican reggae music. “The Harder They Come is the most important movie ever to come out of the Caribbean,” says iTunes, “and its soundtrack helped put reggae, in all its variants, on the world map.” The effusive iTunes praise for the film may be a bit of a stretch, but the part about the music is right on the money. First released in the U.K in 1972, the film was slow to capture much attention. And in the U.S., too, at least with its initial release in February 1973, the film did not receive much notice. About a year later, however, it became more popular with audiences in midnight showings. And from that point on, the film’s music also began to take off. The soundtrack became a breakthrough for reggae music in the U.S., introducing many listeners to the distinctive sound for the fist time. The Harder They Come soon became a favorite dance album at parties across the U.S. It left a lasting impact and its influence on the music scene continues today. The soundtrack’s selections are also loaded with Jamaican nuance and political meaning, as the lyrics, both directly and between the lines, refer frequently to oppression, inequality, and social injustice. What follows here, is an exploration of the film’s music along with historical background on Jimmy Cliff and the album’s other artists, as well as the film’s producer, Perry Henzell. 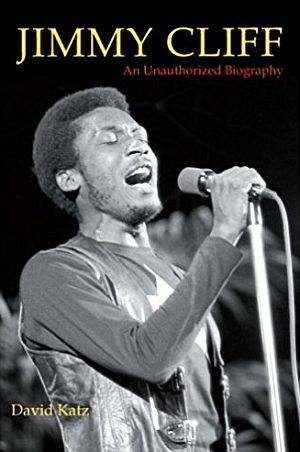 Cover of David Katz’s book, “Jimmy Cliff: An Unauthorized Biography,” 2011. Click for book. The Harder They Come was the first Jamaican-produced feature film shot in Jamaica with a full Jamaican cast and director. The film starred Jimmy Cliff, who plays a role in the film which, in part, is not unlike his own early years. Jimmy Cliff had left his country home as a teenager in 1962 heading to Kingston where he began cutting tracks for DJs to consider. With the help of producer Leslie Kong, he had a couple of hits, including a No. 1 Jamaican hit,”Hurricane Hattie” and others. By 1965, Cliff was in London, and eventually scored there with another Top Ten international hit 1969, “Wonderful World, Beautiful People,” one of the first big reggae hits heard outside of Jamaica. He also wrote and sang “The Harder They Come” title track for the 1972 film. …In 1969, I was at Dynamic Sounds Studio in Kingston recording a song I had written, ‘You Can Get It If You Really Want.” When we finished, I walked outside and met a gentleman named Perry Henzell, who had been waiting for me. He said he was making a movie and asked if I could write music for it. They never seem to hear even your cry. the harder they’ll fall, one and all. they know not what they’ve done. Than living as a puppet or a slave. By that point, I was pretty well known in Jamaica and the U.K. I had recorded quite a few hits. I had always wanted to be a movie actor, so I asked Perry to send me the script. When I read it, I felt I had known Ivanhoe Martin [the main character] all my life. In the script, he was a guy from the country who came to the city to make it as a musician but was held back by the trickery of a record-company owner. Eventually Ivan turns to crime and is killed at the end. I told Perry that the script was great, and he decided to cast me as Ivan. The film at the time was called “Hard Road to Travel,” after one of my songs, and we filmed over the next year or so. When we shot the scene where Ivan cuts the bicycle-store owner who came on really hard, a line came to my mind—”the harder they come.” In real life, if you come on hard like that, you’re going to die hard. When I told Perry my line, he loved it. He thought it was a stronger film title and asked me to write a theme song to go with it…. …The lyrics came from my past. I grew up in the church and had always questioned what they were telling me. Like the promise of a pie in the sky when you die. The second verse about oppressors trying to keep me down kind of reflected my own life—coming out of the ghetto in Jamaica and fighting the system. I wanted the song to have a church feel and to reflect the environment I grew up in—the underdog fighting all kinds of trickery. 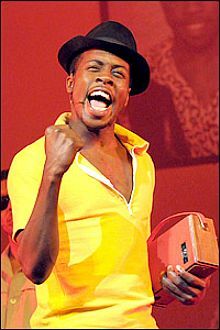 In the film, Cliff plays Ivanhoe “Ivan” Martin, a country boy who heads to Kingston, Jamaica, to seek fame as a singer. After being taken advantage of by a record producer who pays him only $20 for recording his first song, Ivanhoe Martin turns to a life of crime, dealing marijuana, and becoming a cop-killing folk hero – a character modeled in part on an actual 1940s Jamaican criminal who was not a musician. In the film, it is Ivanhoe’s criminal notoriety and folk hero standing that ironically sends his record to the top of the Jamaican charts. The title song, by Cliff, is also central in the film story, as it is the song that Ivanhoe Martin records to launch his own career. It is also a song that intimates the hard life of Jamaica’s poor. In the end, the film wasn’t exactly Oscar material – though it still has its fans to this day. Yet the film’s soundtrack was eventually a blockbuster, opening the door to reggae big time. The soundtrack album was released in America in 1973, and proved to be a steady seller, though it didn’t enter Billboard‘s album chart until March 1975. In any case, the early- and mid-1970s was the dawning of a golden time for reggae. 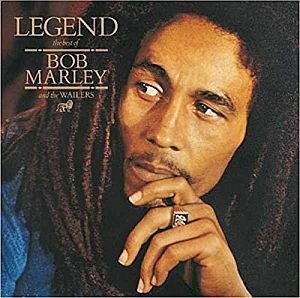 By then, Bob Marley and Wailers had broken through (their first U.S. charting song came about two months after The Harder They Come film was first shown in the U.S.), and others followed. The other six tracks, however, are fine reggae offerings as well, and include Jamaican singles that had been previously released in the 1967-1972 period that were also popular, including: “Draw Your Brakes” by DJ Scotty; “Rivers of Babylon” by the Melodians; “Sweet and Dandy” and “Pressure Drop,” both by Toots & the Maytals; “Johnny Too Bad” by the Slickers; and “007 Shanty Town” by Desmond Dekker. Dekker also had a hit with “You Can Get It If Your Really Want.” Some of these songs and their context are reviewed briefly below. "Draw Your Brakes" on Crystal label, 1971. The second track on the soundtrack album, for example, is “Draw Your Brakes,” by Scotty, also known as DJ Scotty, and formally, David Scott (1951-2003). 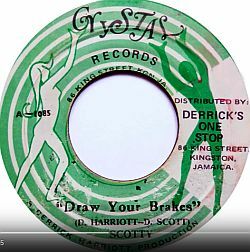 Scotty’s song is a 1971 Jamaican deejay version of Keith & Tex’s hit, “Stop That Train.” It is a lament of man who has just lost his woman to another man. A review of this song at an earlier blog titled, DK Presents 2009, stated that ‘Draw Your Brakes’ is one of the most important tracks on the album –along with The Slickers’ “Johnny Too Bad,” noted later below — Jamaican songs “which take on the twin cultures of violence and grief that are at the heart of the Jamaican ghetto, and the center of the movie.” See also Scotty – “Draw Your Brakes” for full lyrics and additional interpretation. 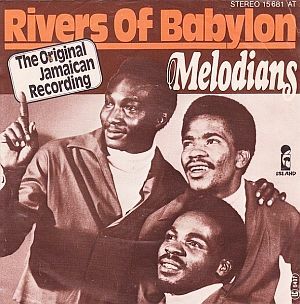 Cover of record sleeve for “Rivers of Babylon” song by The Melodians, Island Records, 1978. Click for single. The third track on The Harder They Come album is “Rivers of Babylon,” a song by the Jamaican group The Melodians. The group was formed in 1963 by Tony Brevett, Brent Dowe. and Trevor McNaughton. “Rivers of Babylon” was written by Dowe and McNaughton and was recorded as a Rastafarian song in 1970, two years before it was used on The Harder They Come. Rastafarianism is a religious movement among black Jamaicans that teaches the redemption of blacks and their return to Africa, employs the ritualistic use of marijuana, and venerates Haile Selassie as a god. (Selassie was Emperor of Ethiopia in 1930). Interestingly, the lyrics of “Rivers of Babylon” are adapted from the texts of Psalm 137 and Psalm 19 in the Bible ( there, in the original, as a hymn expressing the lamentations of the Jewish people in exile following the Babylonian conquest of Jerusalem). In further explanation, Wikipedia notes: “In the Rastafarian faith, the term “Babylon” is used for any governmental system which is either oppressive or unjust. In Jamaica, Rastafarians also use ‘Babylon’ to refer to the police, often seen as a source of oppression because they arrest members for the use of marijuana (which is sacramental for Rastafarians). Therefore, ‘By the rivers of Babylon’ refers to living in a repressive society and the longing for freedom. Brent Dowe, the lead singer of the Melodians, told Kenneth Bilby that he had adapted Psalm 137 to the new reggae style because he wanted to increase the public’s consciousness of the growing Rastafarian movement and its calls for black liberation and social justice. Traditional Rastafarian worship often included psalm singing and hymn singing, and “Rastas” typically modified the words to fit their own spiritual conceptions; Psalm 137 was among their sacred chants. But after a round of criticism for banning a song that was taken almost entirely from the Bible, the government backed down. Three weeks later “Rivers of Babylon” was a No. 1 hit in Jamaica. The Harder They Come film and soundtrack album then took it to an international audience. In 1978, the song was further popularized in Europe by the Boney M. cover version, which became one of the Top Ten all-time best-selling singles in the UK. The song was later used in the 1999 Nicolas Cage movie, Bringing Out the Dead, and again in 2010 in Philip Seymour Hoffman’s film, Jack Goes Boating. Cover art for “Many Rivers to Cross” single by Jimmy Cliff, issued by Trojan Records in 1969. Click for single. 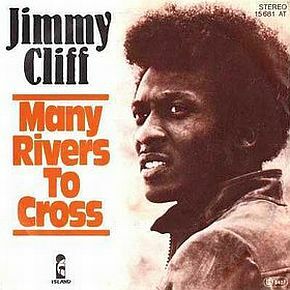 “Many Rivers to Cross” – also on The Harder They Come soundtrack – is a song written in 1969 by Jimmy Cliff, released on his earlier 1969 album, Jimmy Cliff. The song has often been described for its church-like or hymnal quality, arranged with organ and a gospel backing. When I came to the UK, I was still in my teens. I came full of vigor: I’m going to make it, I’m going to be up there with the Beatles and the Stones. And it wasn’t really going like that, I was touring clubs, not breaking through. I was struggling, with work, life, my identity, I couldn’t find my place; frustration fueled the song. Rolling Stone has ranked “Many Rivers to Cross” at No. 325 on their list of the 500 Greatest Songs of All Time. The song has been covered by a number of artists, including: Harry Nilsson, John Lennon, Joe Cocker, Percy Sledge, Desmond Dekker, UB40, Cher, Eric Burdon & The Animals, Marcia Hines, Toni Childs, Oleta Adams, Linda Rondstadt, and Annie Lennox. In 2013, Tessanne Chin performed a cover of “Many Rivers to Cross” on a live round of NBC-TV’s The Voice. 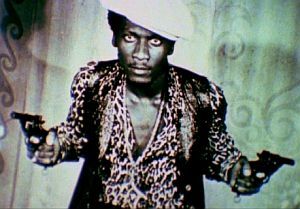 Her rendition spurred some interest in the original Jimmy Cliff version, as Billboard’s Digital Singles chart indicated that “Many Rivers to Cross” sold 707 downloads the week Chin performed. As of mid-November 2013, Cliff’s song had sold more than 87,000 downloads since Neilsen Soundscan began tracking digital sales of reggae singles in 2008. “Many Rivers to Cross” has also been featured in the film Rush (2013) and during episodes of TV shows such as: the Australian-American comedy series Wilfred (2011-2014); the Netflix TV series, Daredevil (2015-16),based on the Marvel Comics character; and the post-apocalyptic series, Falling Skies (2011-15), produced by Steven Spielberg. Promotional photo from “The Harder They Come” with Jimmy Cliff featured as pistol-packing Ivanhoe Martin. Cover art for Slickers’ 2006 reissued “Breakthrough” album by Tad's Records, which includes 'Johnny Too Bad'. Click for CD. “Johnny Too Bad,” the 7th track on The Harder They Come, is a song recorded by the Slickers, a Jamaican group that began in the mid-1960s. Now you’re too bad (too bad)…. After its use on the soundtrack album, the original version of “Johnny Too Bad” became one of the most celebrated tracks ever recorded in Jamaica. The Slickers toured the U.S. and the U.K. on the success of the song, continuing until they recorded their album Breakthrough in 1979. Some version of the Slickers group continued touring in both the U.S. and Europe, releasing occasional singles through the 1970s before ceasing as a group sometime in the late 1970s. Countless versions of “Johnny Too Bad” have been recorded by other musicians in a variety of styles. The song was covered by the British reggae group UB40, the American reggae punk band Sublime, American power pop band, The Silencers, and blues artist Taj Mahal. John Martyn covered it with additional lyrics on his 1980 album Grace and Danger. 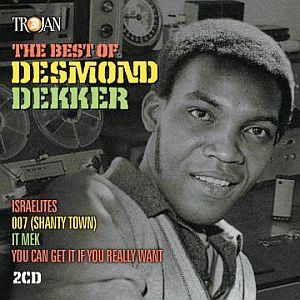 Cover of 2-CD set of “The Best of Desmond Dekker” on the Trojan label, London, 2016. Click for CD. Desmond Dekker is another Jamaican artist who had an earlier hit song – his “007 (Shanty Town)” – featured on The Harder They Come soundtrack album. Dekker (1941 – 2006) was a popular Jamaican ska, rocksteady, and reggae singer-songwriter and musician who had already had several Jamaican hit songs in the early 1960s. But in 1967, Dekker’s “007 (Shanty Town)” became his first international hit, rising to No 1 in Jamaica and No. 14 on the UK singles chart – the first Jamaican-produced record to reach the UK top 20, which then demonstrated the viability of Jamaican music in England. It was followed by another much bigger hit with Dekker’s “Israelites” in 1968 (U.S. pop, No. 9, 1969), which uses lyrical imagery from the Biblical Exodus story. “007 (Shanty Town)” was released in the U.K. as a 1967 single on the Pryamid label. The song has been called “the most enduring and archetypal” rude boy song. Its title and lyrics also hint at James Bond and Oceans 11 film imagery, then admired by Jamaican rude boys. According to Dekker, the song was also inspired in part by news coverage he had watched of a student demonstration protesting construction of an industrial complex near the beach in the Shanty Town area, where violence had erupted. The song also deals with rude boy violence and rude boys being released from prison, but continuing to commit crime. “If any song can be said to epitomize the entire rudeboy era, ‘007 (Shanty-Town)’ is it. The song has it all: a melody that once heard is never forgotten, a brilliant arrangement that’s all stomping beats emphasized by every one of the instruments, references to cool movies — from the Bond films’ hero to the equally hip Rat Pack flick Ocean’s 11 — and lyrics aimed directly at the rudies. Desmond Dekker succinctly sums up rudeboy ways, looting and shooting their way across the shanty-towns that surround Kingston. Amongst a clutch of pithy lyrics, “Rudeboys have no fear [or cannot fail]” was the line that inevitably brought whoops from every rudie on the dancefloor. In The Harder They Come film, with Ivanhoe Martin doing his looting and shooting, Dekker’s tune also hits the mark — though in his earlier career, Dekker’s music had been associated with tamer, more traditional values. 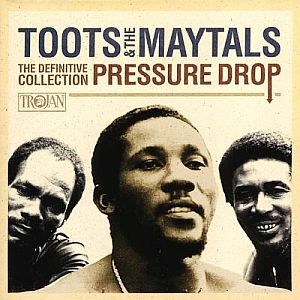 Cover of CD with selections by Toots & The Maytals, The Definitive Collection, Trojan. Click for CD. “Pressure Drop,” by the Maytals, is another fine example of the infectious reggae sound. The song was written by Frederick Hibbert and recorded by The Maytals in 1969 for producer Leslie Kong. It was released as a single and on their 1970 album, Monkey Man and …. In 2004, Rolling Stone rated “Pressure Drop” at No. 453 in its list of the 500 Greatest Songs of All Time. The song has been covered by other artists including, The Specials and The Clash, and it is also featured in the 2004 video game Grand Theft Auto: San Andreas. 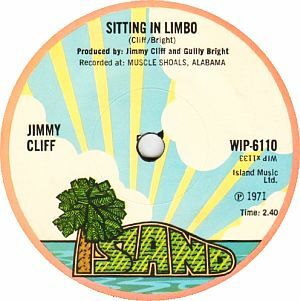 Disc label for Jimmy Cliff’s “Sitting In Limbo” single, released in 1971, Island Music Ltd. Click for single. In 1971, Leslie Kong died – the producer Jimmy Cliff (and other Jamaicans) had worked with since his early youth, at age 14. According to AllMusic.com, Cliff was racked by the loss, and was not sure how to proceed. 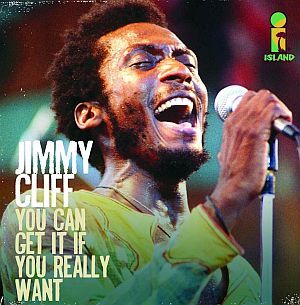 Jimmy Cliff on cover of later released CD of "You Can Get It If You Really Want." Click for single. The next-to-the last track on The Harder They Come soundtrack album – as well as the album’s opening song – is also a song by Jimmy Cliff: “You Can Get It If You Really Want.” This is a song Cliff had originally written for Desmond Dekker in 1969. Dekker’s version of the song became a hit first, released as a single in a number of markets. It rose to No. 2 on the U.K. Singles Chart. It was also ranked at No. 27 on the 1970 year-end U.K. chart. In 1969 Perry Henzell heard Jimmy Cliff’s song, “Many Rivers to Cross,” and sensed it would be a good fit for a film he had in mind about a Jamaican’s struggle to make it. He also asked Cliff to work up some other songs for the film. But once the film was made, bringing it to a wider audience beyond Jamaica was the next step, and one fraught with challenge. Perry Henzell, Jamaican film producer, at work, 1970s. In London, he tried distributing the film himself, resorting at one point to handing out 5,000 fliers at bus and subway stops. He eventually hooked up with producer Roger Corman to help distribute the film, but that effort did not fare well initially either. In the U.S., midnight showings of the film in some college towns helped bring word-of-mouth cache, and by 1974-75 its music in particular helped broaden its marketing. Respectable reviews soon arrived (see samples in reproduced poster below). Henzell had plans for what he hoped would be a trilogy of films centering on Jamaica and Ivanhoe Martin. A next film in that series, No Place Like Home, was started by Henzell in the 1970s but later abandoned for lack of funds. Some years later, Henzell rediscovered bits of the film and reworked it. Eventually, No Place Like Home was shown at the Toronto International Film Festival to sold-out audiences in September 2006. The film was then scheduled to be screened at the Flashpoint Film Festival in Negril, Jamaica in early December 2006. However, Perry Henzell died of cancer in November 2006. He was 70 years old. In 2015, a documentary film – Perry Henzell: A Filmmaker’s Odyssey, which explores Henzell’s journey in making No Place Like Home – was released by David Garonzik and Arthur Gorson. 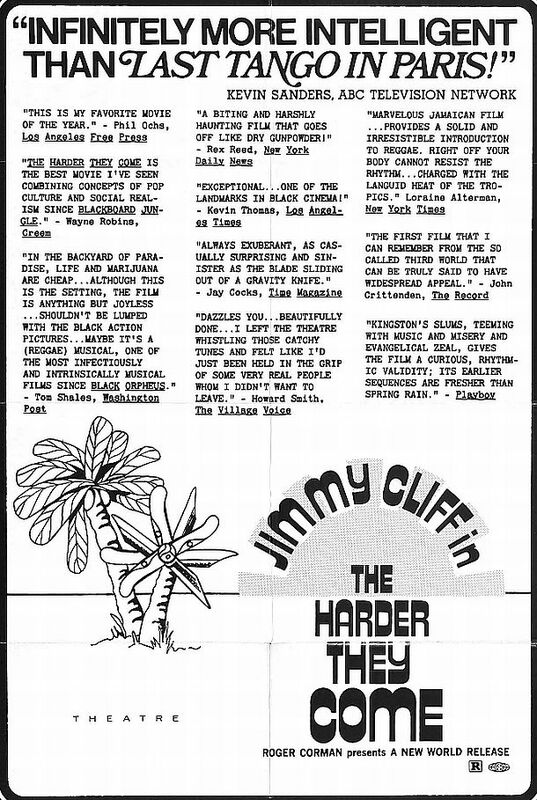 1970s promo piece for film “The Harder They Come,” with a headlined review contrasting it with the Marlon Brando film of that era, ‘Last Tango in Paris.” A selection of other reviewer comments are also offered. In later years, both the film and the music would collect kudos and spawn a number of other projects. The Harder They Come soundtrack was ranked No.12 on one list of the “100 Best Film Soundtracks,” those described as “soundtracks that moved us the most” by Entertainment Weekly. In 1980, Jamaican-American author Michael Thelwell published a novel based on the film, using the same title. In August 2003, the Universal Music Group issued a two-disc deluxe edition of The Harder They Come soundtrack album, remastered with the second disc featuring additional reggae singles from 1968-1972. In 2005, the film story was developed into a stage musical by the Theatre Royal Stratford East and U.K. Arts Productions in London. The script for that production was overseen by Perry Henzell who also served as production consultant. It opened in London in March 2006 and played through 2008, going on international tour thereafter. The stage production used the original soundtrack as well as a couple of additions. In 2006, The Harder They Come film was also digitally restored, frame by frame, and issued in a remastered DVD version. In 2013, there was a 40th anniversary celebration of the film and its re-release. Jimmy Cliff, meanwhile, was propelled to international fame by The Harder They Come. Not long after the film became popular, Cliff helped introduce reggae to America by performing two songs from the film on the first season of the Saturday Night Live TV show, episode 12, on January 31, 1976. Cliff that night sang the title track, “The Harder They Come” and “Many Rivers to Cross.” Since those heady years of the 1970s, Cliff has done a variety of work in film and music, much of which is detailed at his Wikipedia page and elsewhere. Cliff provided backing vocals on The Rolling Stones’ 1986 album Dirty Work, and appeared in the comedy Club Paradise, co-starring with Robin Williams and Peter O’Toole, also contributing several songs to the soundtrack, including “Seven Day Weekend,” which he sang with Elvis Costello. In 1988, his song “Shelter of Your Love” was featured in the hit film Cocktail. Cliff returned to the American music charts in 1993 with his Top 20 cover of “I Can See Clearly Now,” from the soundtrack for Cool Runnings. In March 2010 he was inducted into the Rock and Roll Hall of Fame. As of this writing he continues to perform and lives in Jamaica. 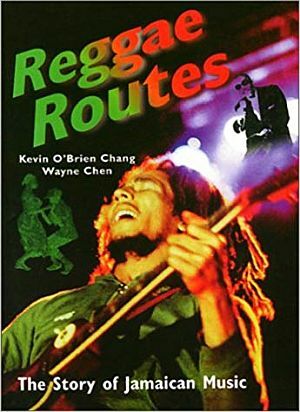 1998 book, "Reggae Routes: The Story of Jamaican Music," Temple University Press, 246 pp. "Best of Bob Marley and the Wailer, 2002. Click for CD. 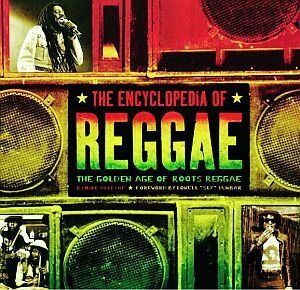 "The Encyclopedia of Reggae," 352pp, 2012. Click for book. 40th anniversary film poster for “The Harder they Come,” 2013. “Jimmy Cliff,” in Holly George-Warren and Patricia Romanowski (eds), The Rolling Stone Encyclopedia of Rock & Roll, Rolling Stone Press, New York, 3rd Edition, 2001, pp. 185-186. “The Harder They Come,” Wikipedia.org. Tom Moon, “Reggae Rises Here: The Harder They Come, Jimmy Cliff,” 1,000 Recordings to Hear Before You Die, New York: Workman Publishing, pp 174–175. Loraine Alterman, “Pop; It’s Here–Reggae Rock,” New York Times, February 4, 1973, p. 132. Tom Shales, “’Harder They Come’: Good Work, Mahn,” Washington Post, Times Herald, February 14, 1973, p. F-1. Ian Dove, “Records: Black Music; Soundtrack Albums of 2 Films Include Reggae Pieces From West Indies,” New York Times, February 14, 1973. John Rockwell, “Jimmy Cliff Makes His American Debut Exciting, Formal [at Carnegie Hall],” New York Times, November 18, 1974. John Rockwell, “The Pop Life; Toots and Maytals in a Reggae Year,” New York Times, September 26, 1975. Tom Zito, “Jimmy Cliff: Bringing the ‘Freshest Form of Music’ From Jamaica to the U. S.,” Washington Post, October 28, 1975, p. B-9. Stephen Davis, “Reggae Jamaica’s Inside-Out Rock and Roll; Reggae It’s Inside-Out Rock,” New York Times, November 30, 1975. “80th Straight Weekend for Reggae Film,” New York Times, April 30, 1976. John Rockwell, “Jimmy Cliff And Reggae In the Park,” New York Times, September 1, 1976. National Public Radio, Morning Edition, “’The Harder They Come’ – Jimmy Cliff Film, Soundtrack Sparked the ’70s Reggae Explosion,” NPR.org, October 22, 2003. Toby Ball, “The Harder They Come,” All Music.com Review. “The Harder They Come”(song), Wikipedia .org. “The 20 Greatest Reggae Albums Of All-Time,” DK Presents, June 2009. “Desmond Dekker,” in Holly George-Warren and Patricia Romanowski (eds), The Rolling Stone Encyclopedia of Rock & Roll, Rolling Stone Press, New York, 3rd Edition, 2001, p. 249. “Many Rivers to Cross,” Wikipedia.org. Adam Jones, “The Harder They Come”-Jimmy Cliff,” Anthems for A New Generation, January 13, 2012. Neil McCormick, “Jimmy Cliff Interview: ‘I Still Have Many Rivers to Cross’,” The Telegraph(London), July 12, 2012. Colin Jacobson, Review, “The Harder They Come: The Criterion Collection (1973),” DVD Movie Guide. 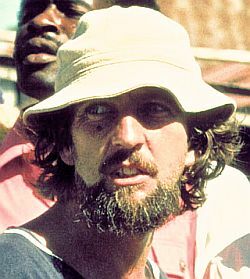 Dennis McLellan, “Perry Henzell, 70; His Movie `The Harder They Come’ Brought Reggae to the World,” Los Angeles Times, December 2, 2006. 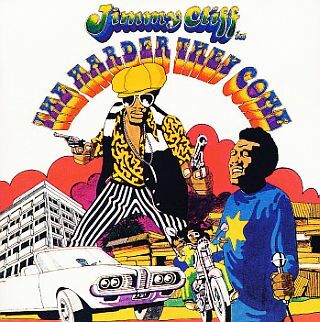 “The Harder They Come (remastered) – Jimmy Cliff,” iTunes.com. Song Review by Jo-Ann Greene, “Sitting in Limbo,” AllMusic.com. Emily Dugan, “‘I Always Support the Lower Classes’: Jimmy Cliff’s Response to His Adoption by Cameron,” The Independent, October 5, 2007. “You Can Get It If You Really Want, by Jimmy Cliff,” SongFacts.com. Mike Riggs. “Is Reggae Classic ‘You Can Get It If You Really Want’ ‘Conservative’? Jimmy Cliff Weighs In,” The Washington Times, June 6, 2012. Marc Myers, “Anatomy of a Song; The Song That Put Reggae on The Map,” Wall Street Journal, updated February 14, 2013. Dave Simpson, “Toots and the Maytals: How We Made Pressure Drop,” The Guardian, September 6, 2016. 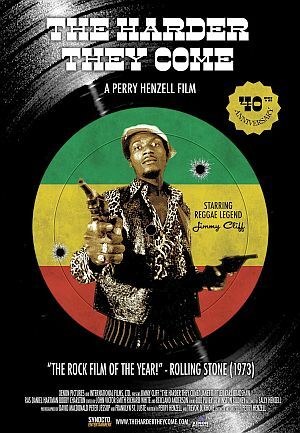 “Perry Henzell, 70, Filmmaker of ‘The Harder They Come,’ Dies,” New York Times, December 5, 2006. Entertainment Weekly, “America’s 100 Best Movie Soundtracks,” FilmSite.org. Kevin Jackson, “Chin, Cliff Surge, Dancehall Stumbles,” Jamaica Observer, Sunday, November 17, 2013.